It was just a matter of time before the sheer magnitude of the Morgellons epidemic caught the interest of honest, independent scientists. See link below. Finally, a new 2015 study is cracking open the door that was shut hard by the CDC cover-up study. And it was a cover-up. NO ONE and I mean NO ONE will allow the idea that the genetic modification of living organisms has created NEW, MANMADE, GENETICALLY MODIFIED, BIOSYNTHETIC disease. Possibly contagious. To all of you afflicted with Morgellons…keep posting your pictures, share your experiences online, spread your unique knowledge – only you can communicate loudly and repeatedly to the rest of us – we all need to learn what genetically modified biosynthetic disease looks like and feels like. As more and more of you share your stories – honest scientists will hear of you and be spurred by curiosity. I’m aware of this disease and I don’t suffer from it. In fact, I don’t know anyone that suffers from it. I just wanted to let all of you afflicted by this horrible illness, that more and more of us out here are hearing of Morgellon’s. I first saw it on TV. I believe I was watching the discovery channel and immediately became concerned. After reading certain comments, I will try to protect my family by carefully reviewing any products we consume, what we eat, and our environment /contact with others. I am so sorry that you have to suffer in this painful and debilitating manner. I hope all of you find the answers you deserve. Just please remember, doctors aren’t always right. If doctors don’t believe you, rest assured I do and so do many others. Morgellons is like the fairy tale from Hansel and Gretel. To understand Morgellons, you must follow the crumbs. Morgellons skin fibers appear to contain cellulose. All Morgellons patients screened to date have tested positive for the presence of Agrobacterium genetic material. Agrobacterium is used extensively in high tech genetically modified biopesticides. 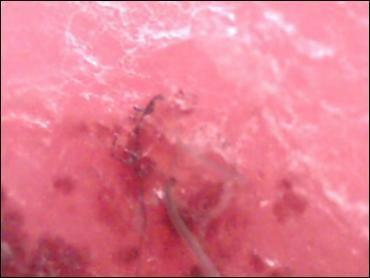 Morgellons fibers often appear blue, red, or black. Morgellons feels like ‘wiggling’ ‘crawling’ fibers. 2007 New Scientist Magazine article describes invention, stating: “Nanoscopic hair-like polymer structures are being developed by US researchers and could help explain the way similar biological appendages, known as cilia, function inside the body”. Morgellons produces and extrudes sand like grains, black ‘seeds’ and tiny crystals. Baculoviruses are used in high tech biopesticides to kill bugs. During the late stages of infection, Bacculoviruses produce particles called occlusion bodies. Polyhedra of many viruses look like clear, irregular crystals of salt or sand. Follow the crumbs. They will lead you to technology. Technology that uses agrobacterium. Technology that uses red, blue and black colors. Technology that uses viruses which produce sand/crystal like particles. Technology that uses cilia-like polymer structures (cilia have a wiggle movement). Follow the crumbs and you will find yourself face to face with a new truth. Man now has the ability to create novel, high tech infections. We have the technology. Biopesticides were intended for bugs. But now they’re in people. Imagine the impact on the biopesticide industry. The genetic engineering industry. The biowarfare research industry. The nano technology industry. You are talking big, big bucks. And not nothin, and no one, is going to get in the way of big big bucks. The emerging disease called Morgellons is caused by nano machines which are believed to receive specific microwave, EMF and ELF signals and information. To what end is not known. The symptoms include open skin lesions from which colored or plain fibers emerge. Some fibers withstand temperatures in excess of 1400 F. Morgellons nano machines are commonly found in all body fluids and orifices, and are believed to routinely achieve total body systemic penetration. Morgellons nano machines seem to have some kind of hive or ‘group intelligence.’ There is strong evidence linking Chemtrail aerosol fibers to Morgellons fibers. Sorry this is posted in the wrong place. Please see Alaria’s post and Mr. Gascu’s response I believe on page 28 of the responses. To Calin Mircea Gascu, I found your response sadly unhelpful. You discount Alaria’s post as 1.6% effective leaving 98.4% as ‘scrap’ as you put it. Exactly how did you come up with that precise number? Did you count the words you found credible then divide by the total number of words? Your post is belittling of Alaria’s information and thoughts, though ironically, you offer nothing beyond your own personal opinions. This is not helpful. Nor does it foster discussion. These are the tactics of internet trolls which can be a real problem for thoughful and civil online discussions. As for your comment regarding ‘proof’, I had to laugh. Have you forgotten that this entire thread and everything posted here is in regards to Morgellons – an affliction that is NOT RECOGNIZED by the medical community and dismissed with a psychological diagnosis of DOP? I am well aware that this thread is viewed by some in the CDC, medical community as well as those involved in the technology that has brought this affliction to everyone here. My guess is that Alaria has hit on something that you prefer not be discussed on this thread. Personally, I found Alaria’s post quite thought-provoking precisely because of the research and facts she presented. Perhaps you could better respond to the information she presented with some facts and research of your own? In any event, I have noticed this thread includes research, facts, theories and intuitive thoughts of many people. All are welcome (in my book at least). In general, as Americans, we have two challenges 1) an incredibly secretive and non-transparent federal government apparatus and 2) we are surrounded by highly complex technologies to the point that no single scientist has the big picture on anything. Everyone is specialized. So the more that the people here are able to research and present their findings, the better. We may not all agree, but the more we critically look at the evidence and analysis presented, the better chance we have on hitting the truth. As I said, I found Alaria’s post thought-provoking and important. And I have given the reasons why in my direct response to her post. I apologize to everyone that this post is a bit long. I just don’t want to see discussion stifled. As for Mr. Gascu, perhaps you could count up the words in my post and let me know what percentage is ‘enough’ and what percentage is ‘scrap’. There is a mysterious skin disease that appeared recently in the world. Some call Morgellons. So far nobody knows an effective remedy for it. The so-called mystery is the fact that they have not found so far causation of illness, due to which we get sick. For that Morgellons is not a skin disease. Morgellons is not a mental illness. Morgellons is not organic disease . Morgellons is not a contagious disease. Morgellons is not an infectious disease. Morgellons is not a disease caused by chemicals. Morgellons is not a disease! Morgellons is a normal reaction of the body to some extremely dangerous factors. Morgellons is a warning sent by our body. He warn us that the colored beads and cheap is not good. I found those harmful factors and I removed. After that I began to recover my lost health. After 90 days of the removal case, my skin is recovering day by day. See photos in the gallery. True skin disease but not limited to attacking any living tissue. Doctors around the world are overwhelmed. For those reading on the Internet the strangest explanations. From aliens, conspiracies, chemical agents to one who helped “design” disease. I read them all. The real cause of this reaction is as real and present with us. Located in close proximity to each of us. Know that you pay to have Morgellons? An explanation of MD and treatment information for free.